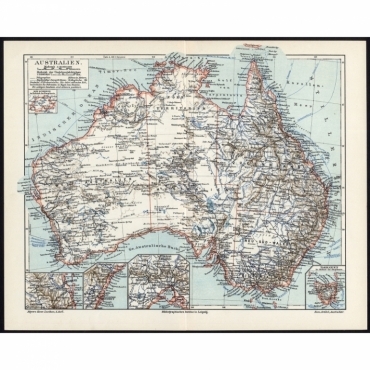 Welcome to our online collection of antique maps of Australia and Oceania. 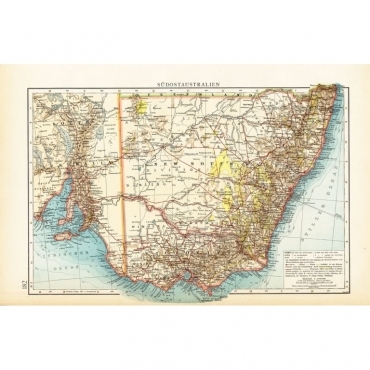 Find antique maps of the mainland of Australia, antique maps of the states of Australia (New South Wales, Queensland, South Australia, Tasmania, Victoria and Western Australia) and antique maps of the cities of Australia (Sydney, Melbourne, Perth, Adelaide and more). 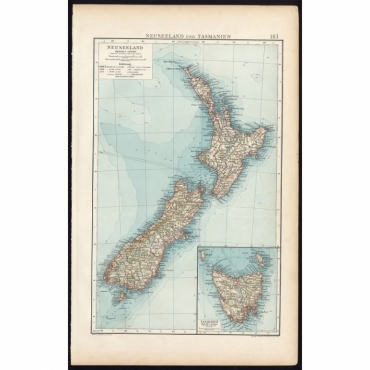 Besides a large collection of antique maps of Australia, we also offer a wide range of antique maps of Oceania. 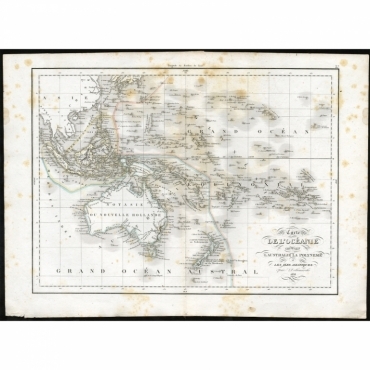 This collection includes antique maps of Australasia, antique maps of Melanesia, antique maps of Micronesia, antique maps of Polynesia and antique maps of the Islands of the Pacific. Welkom bij onze collectie antieke kaarten van Australië en Oceanië. 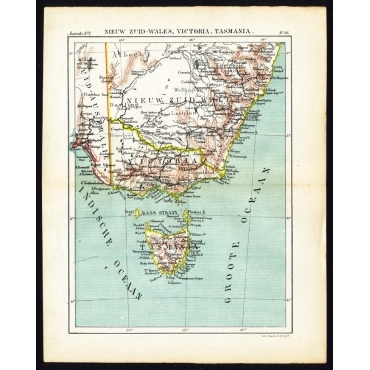 Hier vindt u antieke kaarten van het vaste land van Australië, antieke kaarten van de staten in Australië (New South Wales, Queensland, South Australia, Tasmania, Victoria and Western Australia) en antieke kaarten van steden in Australië (onder andere Sydney, Melbourne, Perth en Adelaide ). Naast een grote collectie antieke kaarten van Australië vindt u bij ons ook antieke kaarten van Oceanië. Zo vindt u onder andere kaarten van Australazië, antieke kaarten van Melanesië, antieke kaarten van Micronesia, antieke kaarten van Polynesië en antieke kaarten van eilanden in de Pacifische Oceaan. 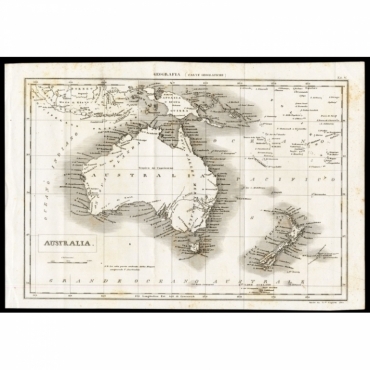 Antique Maps | Australia & Oceania There are 130 products. Map : 'Chart showing the track of the Flagships ...'. 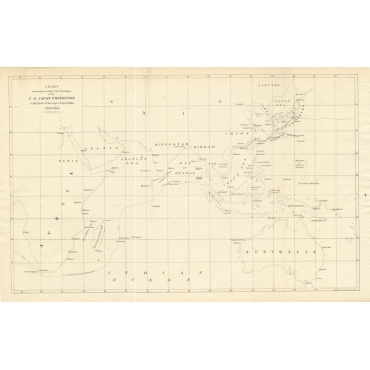 (Map of Africa, Asia and Australia.) Included in the famous 'Narrative of the Expedition of an American Squadron to the China sea and Japan...'. Map: 'Neu-Seeland.' 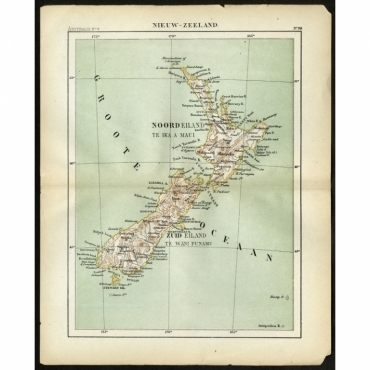 (Map of New Zealand. With inset maps of the large cities.) 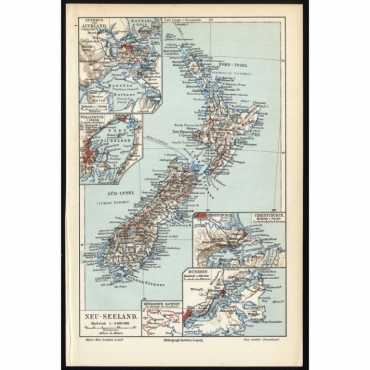 We carry slightly different maps from different editions. Please inquire. 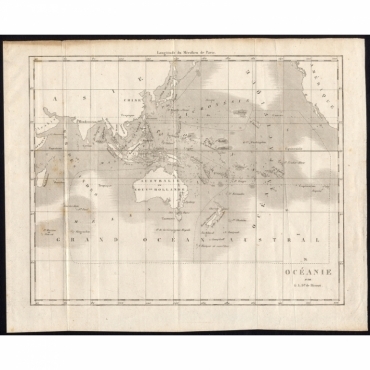 Map: 'Oceanie.' (Map of Oceania.) We carry slightly different maps from different editions. Please inquire. Map: 'Ozeanien.' (Map of Oceania.) We carry slightly different maps from different editions. Please inquire. Map 'Kaiser Wilhelms-Land und Bismarck-Archipel.' (New-Guinea and Bismarck Archipelago.) We carry slightly different maps from different editions. Please inquire. Tav V : 'Geografia; Australia'. (Geography; Australia.) This map shows the continent of Australia. 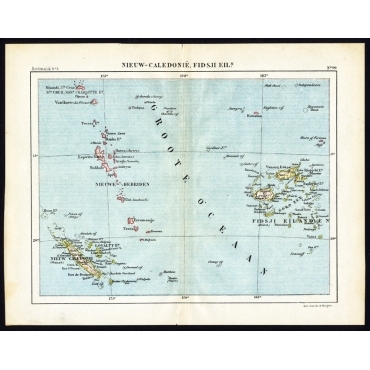 Plate 99 : 'Nieuw Caledonie, Fidsji Eilanden.' (New Caledonia, Fiji Islands). Plate 98 : 'Nieuw Zeeland.' (New Zealand). 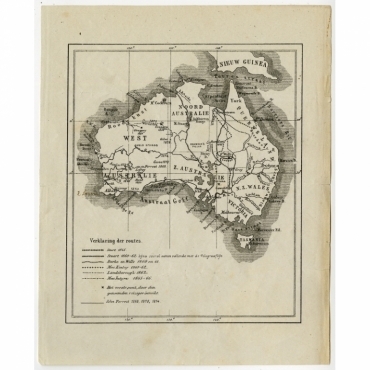 Plate 97 : 'West-Australie.' (Western Australia). Plate 96 : 'Nieuw Zuid-Wales, Victoria, Tasmania.' (New South Wales, Victoria, Tasmania, Australia). Plate 95 : 'Queensland.' (Queensland, Australia). Map Pl. 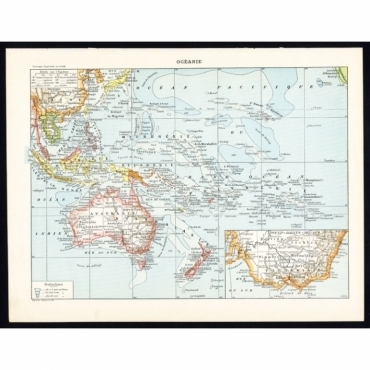 83 - 84: 'Carte de l'Oceanie.' This map shows Oceania with Australia, New Zealand, Indonesia etc. 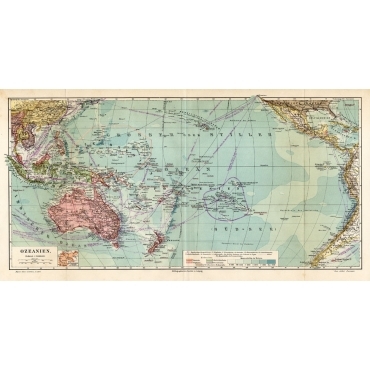 Antique print, titled: 'Melanesie', Map of the Pacific ocean around Australia, including Java, Timor, the Solomon Islands and New Zealand. 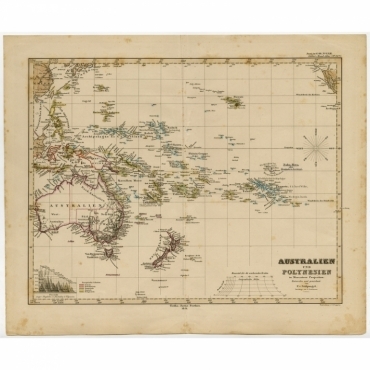 Antique print, titled: 'Carte de l'Oceanie contenant l'Australie la Poynesie et les iles Asiatiques.' 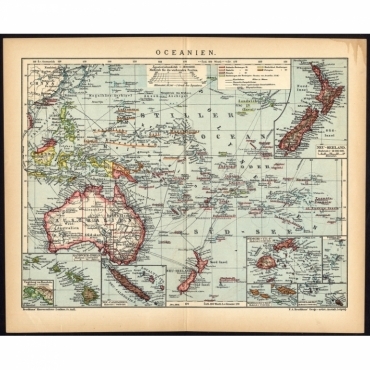 - A map of Oceania comprising Australia and Polynesia, New Zealand and Indonesia. Antique print, untitled. This map shows Australia. 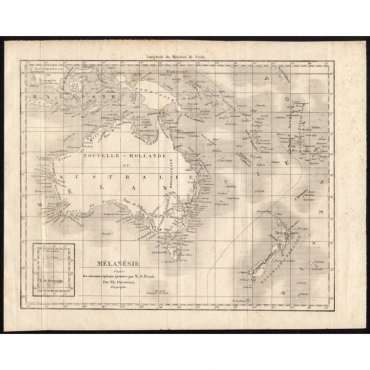 Antique Map, titled: 'Australien und Polynesien in Mercators Projection' - A map of Australia, New Zealand and Oceania. This includes Fiji, Tahiti and several other island groups in the Pacific. On the right edge California is (just) visible. Antique map, titled: 'Plan de l'Ile Oualan. Expedition de la Corvette de S.M. la Coquille Commandee par M.L.I. Duperrey.' - Detailed map and profile of the island Oualan, currently known as Kosrae. This island is one of the many islands of Micronesia in the Pacific Ocean. 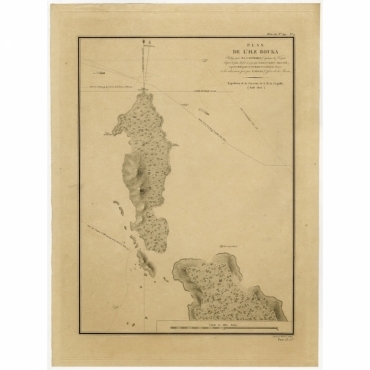 Antique Map, titled: 'Plan de l'Ile Bouka. Expedition de la Corvette de S.M. la Coquille.' 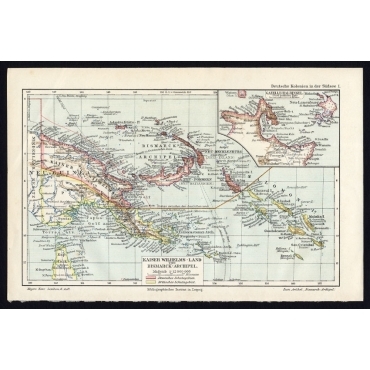 - A map of Buka Island, in the Autonomous Region of Bougainville, in eastern Papua New Guinea. A small part of Bougainville Island shown in the lower edge. Shows the route of the Coquille, the route taken by Bougainville (1768) and the route of Perouse (1792).